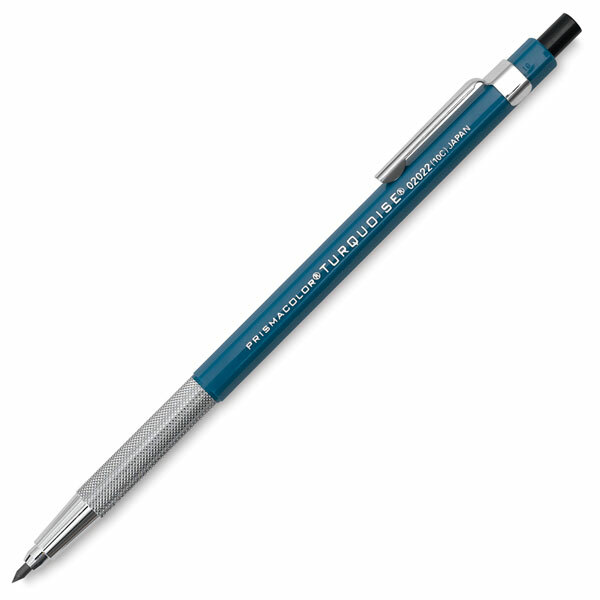 Prismacolor's Turquoise Lead Holder has a plastic barrel, a knurled metal grip, and a push-button spring action. An emergency pointer is located in the removable push button. The pocket clip is removable. Turquoise Leads — Prismacolor's Turquoise Leads fit the Prismacolor Turquoise Holder and other 2 mm lead holders. Tiny particles of electronic graphite provide denser, blacker, smoother writing leads. Turquoise Leads, for use on paper or vellum, measure 5-1/8" long × 3/36" (130 mm × 2 mm). Each box contains 12 leads of the same degree of hardness.